We've got yet another unwelcome visitor, right on our front porch! Good grief, we must be very popular as it seems like the whole world is knocking on our door trying to get in! Today I found this busy fellow building a nest in the eave above our porch. I have to admit I wasted the better part of an hour in the 97 degree heat watching him create his little nest. What an incredible work of art! 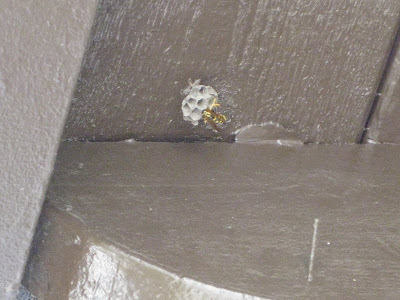 Paper wasps make their nests using their saliva and fibers from dead plants and wood. 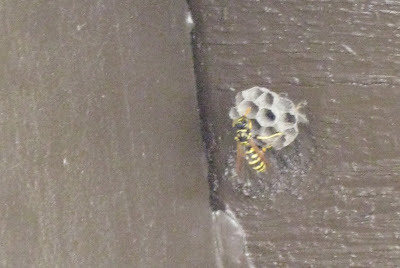 They are pretty beneficial to this area as they keep other pests away, but we can't have a wasp making it's home right at the doorway to our home, especially since we've got some sting allergies in the family. So tonight after the sun sets, the beautiful work of this industrious insect will be no more. I made a flower arrangement to hang on our front door last summer. A wasp made it's nest inside my arrangement. So everytime I opened the door, he was inside my house!